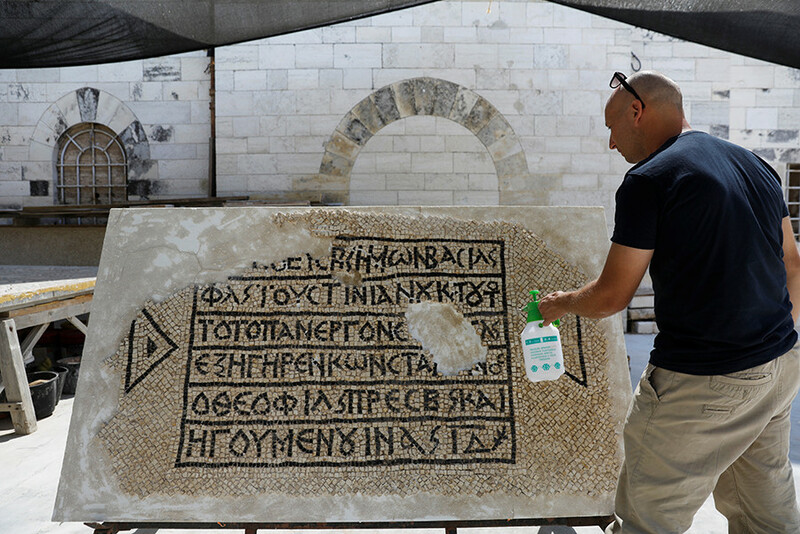 A 1,500-year-old mosaic uncovered in Jerusalem's Old City may once have decorated the floor of an ancient hostel used by pilgrims, according to new research. Archaeologists from the Hebrew University in Jerusalem and the Israel Antiquities Authority believe the find was once part of a hostelry for pilgrims moving to Jerusalem at a time when Christianity was spreading throughout the Eastern Roman Empire. 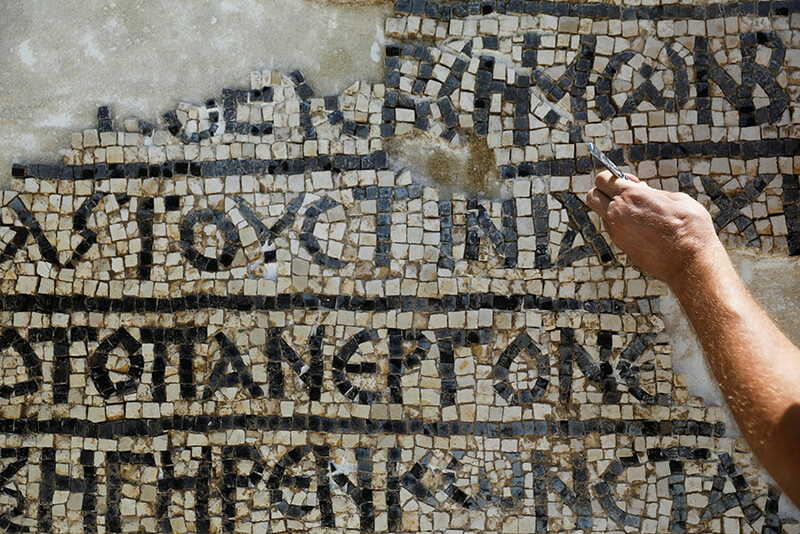 According to inscriptions expert Leah Di Segni of the Hebrew University, the ancient Greek writing reads: "The most pious Roman emperor Flavius Justinian and the most God-loving priest and abbot, Constantine, erected the building in which [this mosaic] sat during the 14th indiction." Emperor Flavius Justinian, while completing the conversion of the pagan Roman Empire to the Christian Byzantine Empire in 543 AD, built a vast and complex church on Mount Zion. The site, dedicated to the Virgin Mary, was called the New Church of the Theotokos, or, the Nea Church. Indiction is an ancient method of counting years that was used for tax purposes. The inscription is said to date back as far as 550AD. "This inscription commemorates the founding of the building by Constantine, the priest. The inscription names the emperor Flavius Justinian. It seems that the building was used as a hostel for pilgrims," said Di Segni. “Every archaeologist dreams of finding an inscription in their excavations, especially one so well preserved and almost entirely intact," he said. ”In the Byzantine period, with the emergence of Christianity, churches, monasteries and hostels for pilgrims were built in the area north of the gate, and the area became one of the most important and active areas of the city," he added. 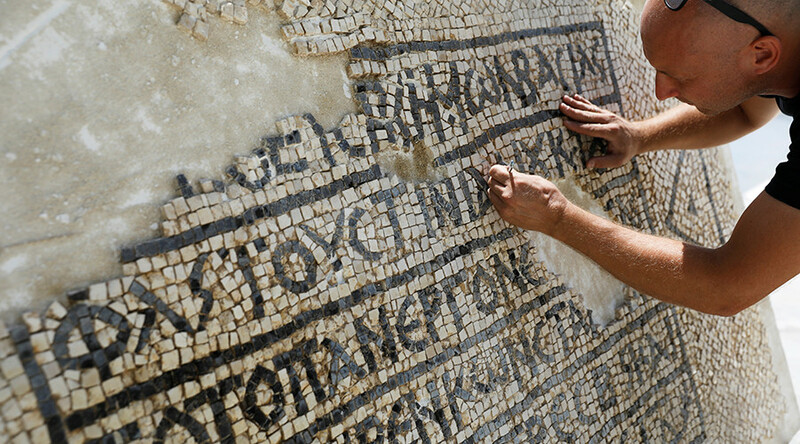 The mosaic was uncovered during works to install communications cables in Jerusalem’s Old City.